The beast that shouted “derp” at the heart of the world. What do you do when you want to make a movie to scare people, but you don’t have enough of a budget for good special effects? 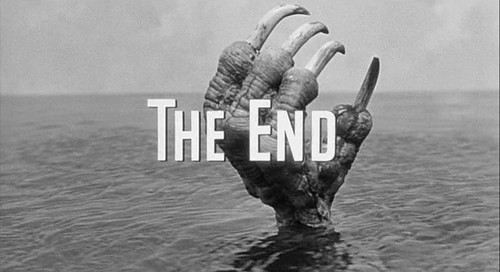 Well, if you were director, Fred Sears, in 1957, you shoot the movie anyway, then worry about the special effects later. Then, if you have any money left, you re-use special effects footage from other films you directed and hire a guy to build a marionette to use for your monster. 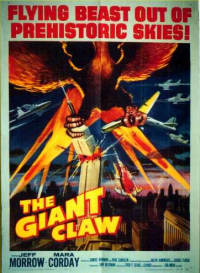 “The Giant Claw” is about a giant bird, either alien, interdimensional or prehistoric, that attacks New York and other cities. “We couldn[t show its head. 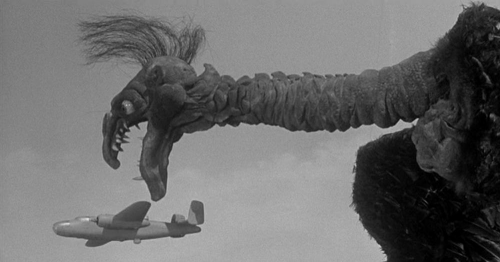 During production of “The Giant Claw,” nobody knew what the bird monster would look like. None of the movie posters show the monster’s head. I don’t know if that’s because they didn’t know what it would look like…. …or if it was because they did. 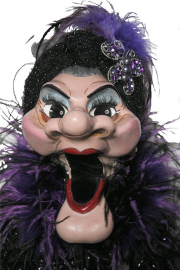 the Ymir from “20 Million Miles To Earth” to build The Cyclops in “The Seventh Voyage of Sinbad,” that after production wrapped on “The Giant Claw,” parts of the beast were recycled to build Waylan Flower’s ventriloquist puppet, Madame. 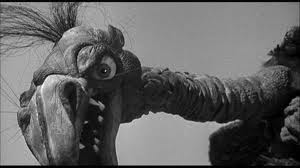 The Monster in “The Giant Claw” is goofy beyond belief. One of the best sources of information on this cheesefest is at BadMoviePlanet.com. How this epic fail of cinematic ineptitude managed to escape the clutches of Mystery Science Theater 3000 is one of life’s great unanswered questions. I was exposed to this movie as a child when my brother, Frank, picked up a Super 8 version off it at K Mart. This was a Castle Films reel, edited down to about twelve minutes, and with no sound. It was a vastly better movie that way, even if the monster looked so damned silly that even the youngest child watching would burst out laughing every time it showed up. Now you can watch the whole thing, to see for yourself.